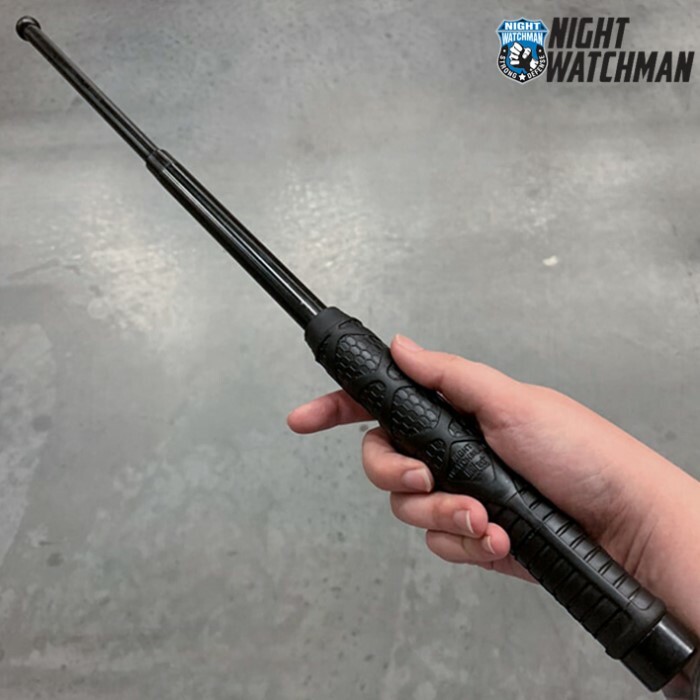 Night Watchman Impact Baton - 21" | BUDK.com - Knives & Swords At The Lowest Prices! 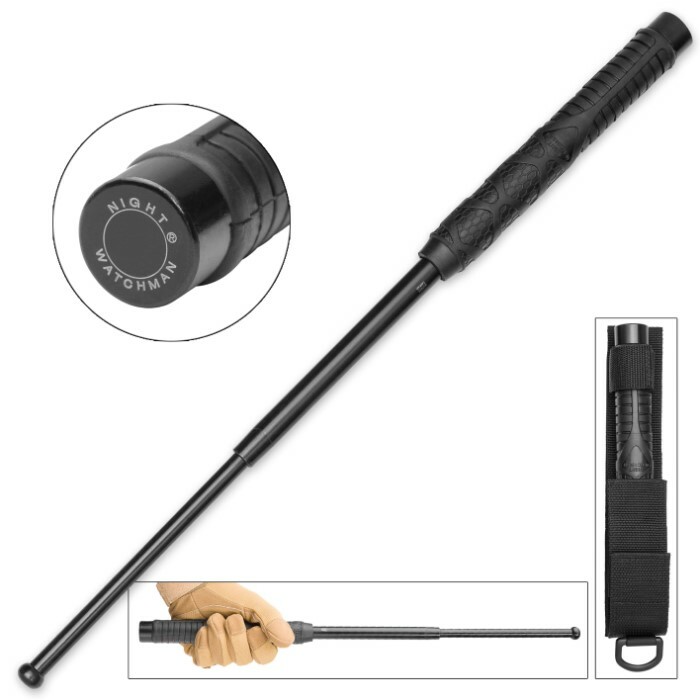 Compact, powerful and easily deployed, this impact baton quickly extends with a simple flick of the wrist. It offers superb balance and control, and a rounded impact point that effectively repels attackers without inflicting cuts. This handy deterrent provides the carrier with confidence in knowing he or she is capable of warding off any would-be assailant. 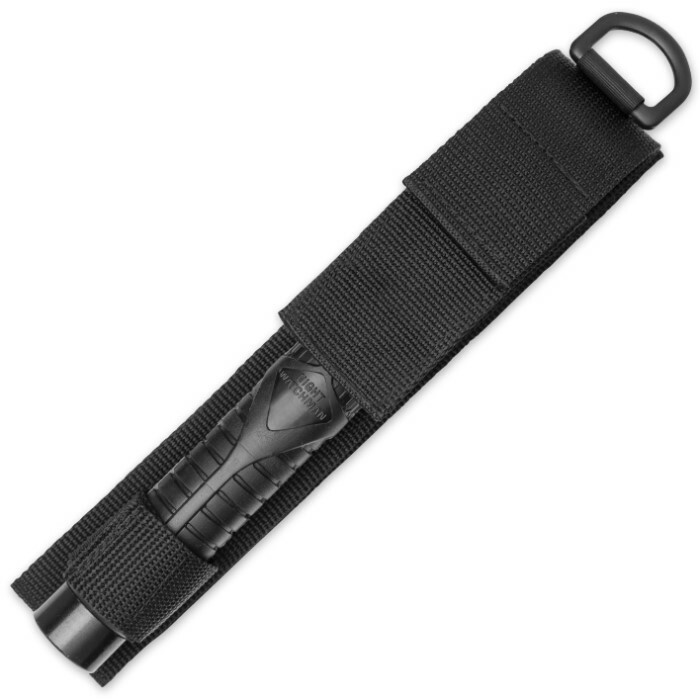 Built to last, it's constructed from heavy duty black steel and has a rubberized, ridged handle for a superior grip. A heavy duty nylon pouch is included. I have read reviews that said they bent. This is a self-defense tool made to adjust attitude. Cinder blocks and 2×4's no. I have several of these sticks, aswell as some S&W sticks. The quality is nearly the same. You can't go wrong here. A good buy. Thank you, BK and Kennisaw for being here. P. Ward. I bought this baton knowing it wasn't going to be great, I planned on just using it to keep in my car. I tested it on soft wood planks and the end piece was bent within a few hits, now it won't fully extend and takes a lot more force to extend what's left. Save up and buy a real baton for more money, you couldn't trust this baton if you actually needed it. So I just received my Night Watchman 21" Impact Baton today and I figured I would test it out against something similar to a human skull seeing as I ordered this in the rare chance that a Z.A (Zombie Apocalypse) happens, I hit a cement brick once and bent the top bar into a banana curve it was easily fixable but I am quite disappointed in the quality of the metal, it is supposed to be steel and that what I expected to receive, this would be a 5 star item if not for the lack of durability. I walk home from work most night so I thought this would be a good pick up. First day I got thought I would test it against a tree........the tree won. Now it's in a L shape. I guess it stand up against a skull or two but not trees. I work in private security, the day i received my purchase i was called into work. i was at work for less than 2 hours when i was forced to use the baton, (from experience) THIS WEAPON WORKS. It is a great non lethal choice, when u carry a gun. I would recommend this weapon to anyone i work with, or anyone in the fields of security or law enforcement.